Right away you know this book wasn’t written by someone from the Midwest. If Leif Enger had written this book, the title would have read The Pretty Decent Run of the Summer Moon. Although Gwynne methodically states his claim, were the Comanches really an empire? When I hear the word, I think of Romans during the time of Christ, the Nazis during WWII and the Dallas Cowboys during the coke-fueled 90’s. I don’t think of a few thousand Comanche warriors wrecking havoc on the southwestern plains at the turn of the century. Gwynne goes on to say the uprising was so vast and overwhelming it displaced forty thousand settlers in the Minnesota territory. 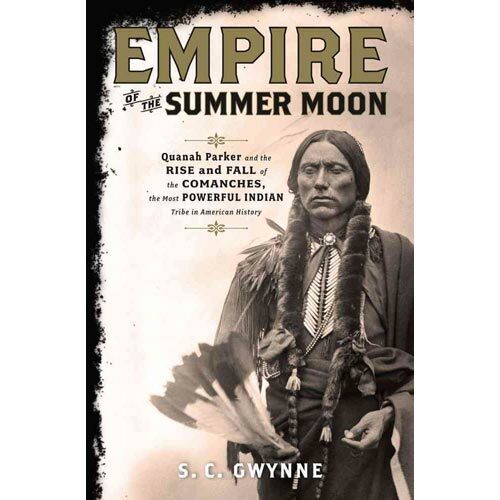 Gwynne tells many skirmishes between the Comanche and Texas settlers but one stood out from the rest. It involved one of the last battles of, Quanah, a feared and legendary chief who led a raid against a group of buffalo hunters holed up in a small outpost called Adobe Walls. Unfortunately for Quanah, the saloon owner at the outpost, a fiery Irishman by the name of James Hanrahan, had advanced knowledge of the attack. But being a business owner, he didn’t want to tell his customers for they would scatter and not pay their bar bill. So, he kept quiet. And to prevent the buffalo hunters from nodding off, he created a fantastic lie by saying the roof would cave in if they didn’t quickly replace the main support beam. The panic caused everybody to pitch in and help, but no Comanche warriors had arrived upon completion. Hanrahan had to think to keep his fighting force awake. HANRAHAN: Well, since that was a quick, is anybody up for putting in a sink? HANRAHAN: You know, there’s a stack of tile in the back room. Does anybody know how to grout? HANRAHAN: Did someone say drinks are on the house? Well that was enough to keep the party going when Quanah and his men made their first run on the outpost at four in the morning. Settlers versus Natives are as old as the endless prairie. But what happens when you bring such a struggle into the home of a modern family…?